Carry emergency gear, including tyre chains, window scraper, fl ares, a small shovel, jumper leads, and a small bag of sand or salt. Have the proper ratio of antifreeze in the radiator. Refer to Engine Coolant on page 6-29 . Inspect the battery and its leads. Cold reduces battery capacity. Use an engine oil appropriate for the lowest ambient temperatures that the vehicle will be driven in (page 6-23 ). Inspect the ignition system for damage and loose connections. Use washer fl uid made with antifreeze— but do not use engine coolant antifreeze for washer fl uid (page 6-32 ). Do not use the parking brake in freezing weather as it may freeze. Remove snow before driving. Snow left on the windscreen is dangerous as it could obstruct vision. Do not apply excessive force to a window scraper when removing ice or frozen snow on the mirror glass and windscreen. Never use warm or hot water for removing snow or ice from windows and mirrors as it could result in the glass cracking. Drive slowly. Braking performance can be adversely affected if snow or ice adheres to the brake components. If this situation occurs, drive the vehicle slowly, releasing the accelerator pedal and lightly applying the brakes several times until the brake performance returns to normal. Use only the same size and type tyres (snow, radial, or non-radial) on all four wheels: Using tyres different in size or type is dangerous. Your vehicle's handling could be greatly affected and result in an accident. Check local regulations before using studded tyres. Do not exceed the maximum permissible speed for your snow tyres or legal speed limits. 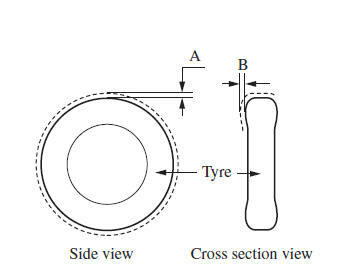 When snow tyres are used, select the specified size and pressure (page 9-10). Check local regulations before using tyre chains. Do not go faster than 50 km/h (30 mph) or the chain manufacturer's recommended limit, whichever is lower. Drive carefully and avoid bumps, holes, and sharp turns. Do not use chains on a temporary spare tyre; it may result in damage to the vehicle and to the tyre. Chains may scratch or chip aluminium wheels. Use of tyre chains on a vehicle equipped with 185/60R16 tyres could cause interference with the vehicle body and scratching. If tyre chains are to be used, replace both the front and rear tyres with 185/65R15 tyres and replace both the front and rear wheels with genuine Mazda 15-inch wheels of the same size, and use genuine Mazda tyre chains. Consult an expert repairer, we recommend an Authorised Mazda Repairer. Install the chains on the front tyres only. Do not use chains on the rear tyres. Mazda recommends hexagon type steel ring chains. Select the proper type according to your tyre size. 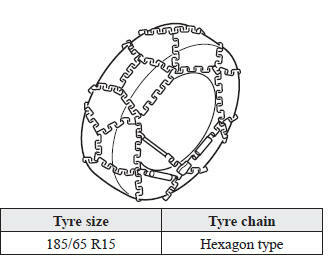 Although Mazda recommends hexagon type steel ring chains, all chains within the installation specifications may be used. When installing tyre chains, the distance between the tyre tread and the chain must be within the prescribed limits in the following table. If your vehicle is equipped with wheel covers remove them, otherwise the chain bands will scratch them. Secure the chains on the front tyres as tightly as possible. Always follow the chain manufacturer's instructions. Retighten the chains after driving 1/2—1 km (1/4—1/2 mile).